On Wednesday 16 December 2009, many milblogs -- including This Ain't Hell, From My Position, Blackfive, Miss Ladybug, BostonMaggie, Grim's Hall, and those participating in the Wednesday Hero program -- are going silent for the day. Some are choosing to go silent for a longer period of time. The catalyst has been the treatment of milblogger C.J. Grisham of A Soldier's Perspective. C.J. has earned accolades and respect, from the White House on down for his honest, and sometimes blunt, discussion of issues -- particularly PTSD. In the last few months, C.J. has seen an issue with a local school taken to his command who failed to back him, and has even seen his effort to deal with PTSD, and lead his men in same by example, used against him as a part of this. Ultimately, C.J. has had to sell his blog to help raise funds for his defense in this matter. An excellent story on the situation with C.J. 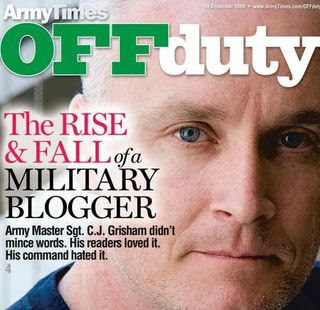 can be found at Military Times: "Off Duty, the Rise and Fall of a Military Blogger " While there have been new developments, the core problem remains, and C.J. is having to raise funds to cover legal expenses to protect both his good name and his career. Please write "Grisham Legal Fund" in the memo line if you use this option. Milblogs have been a vital link in getting accurate news and information about the military, and military operations, to you. Today, many milblogs are gone and others are under attack from within and without. Today, you have the chance to imagine a world without milblogs, and to do something about it. Make your voice heard by writing your congressional representatives and others, and by making donations as you see fit. Count me in as well. Wish I could do more to help. Right on, Maggie! Right on, LOOONG time!!! We're there too and I cross posted at Red State. Awesome post!!! I really like your blog!!! Sweet site, I hadn't noticed bostonmaggie.blogspot.com before during my searches! This is a inquiry for the webmaster/admin here at bostonmaggie.blogspot.com. Can I use some of the information from this post above if I give a backlink back to this website? I don't understand why do they care? Everyone is entitled to do whatever makes them happy whether it's writing blog posts or exercising. Why does the military care? Are You A Facebook Fan of the USNI? Somebody Wanna Get Me A Glass? Happy Birthday to the USNI Blog! So, Anyone Want To Explain The Facebook Visits? Will You Be In Boston This Coming Weekend?